Easter is just over a week away and while these guys have been around in shops since early February, I've resisted the urge to buy any, thinking I'll make some fresh ones instead. 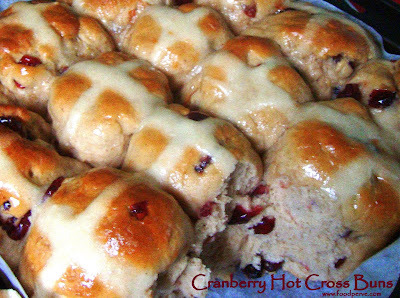 So yesterday, I came across a recipe for some yummy hot cross buns (or Cartesian plane buns- for those who are a-religious?!) and set about making them, only to realise halfway that I had no sultanas, currants or choc nibs to use for the dough. Doh! Feeling extra lazy and resisting the urge to jump in the car and go down to the supermarket, I found a wonderful substitute for the juicy sultanas in my cupboard so used them instead! The end result was a slightly more tart, berry version of hot cross buns, which I'm looking forward to enjoying and sharing with lab folks tomorrow for morning tea! Here's a similar recipe to the one I followed, just substitute dried cranberries and include the juice of 1/2 orange and its zest in the recipe. It makes it extra fragrant without the bitter taste of mixed peel- yuk! Nice Blog im really enjoying it ... :) Everything loks yummy!" yeah, yuk to peel in hot cross buns!! great idea for cranberry substitute, your lucky workmates m's. hope you're well, see you soon chick! Yum yum! These were delish M!